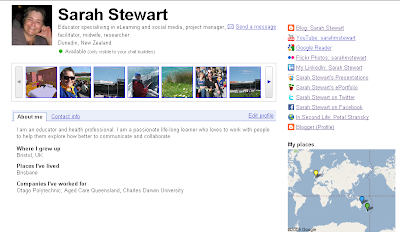 Sarah Stewart: Do you have a public Google profile? Having a public Google Profile will increase your presence on the Internet which is particularly important if you want to promote yourself online for whatever reason. The instructions on how to do it can be found here. What I like about it is that it very easily hooks in your other online channels like YouTube, Slideshare and blog accounts. 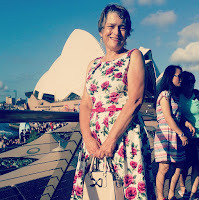 Let me know how to find your profile - I'd love to have a look to see how you use it. Your post was a good reminder to take another look at the profile I created months ago and forgot about. It definitely needs some tweaking, but here's the link. @InfoMidwife, I believe that you can choose exactly what you make public, so if you do not wish to link your blog to your profile you don't have to. Cheers!